Work is on track for the launch of the Diabetes Digital Coach online service in May 2017, enabling people with diabetes in the West of England to better self-manage their condition. Funded through Innovate UK, Diabetes Digital Coach is one of seven NHS test bed projects. The project is building a specially selected suite of integrated digital tools, supporting people with diabetes to ‘do the right thing at the right time’. It will also encourage more timely and appropriate interventions from peers, healthcare professionals, carers and social networks. There are 11 organisations in the Diabetes Digital Coach consortium, working alongside the West of England ASHN as lead organisation. We are currently working with commissioners and health service providers in the region as well as the charity Diabetes UK in the run-up to the platform’s launch next spring to ensure as many people as possible get the opportunity to use and evaluate the digital self-management technology. The test bed is attracting significant national attention and members of the project team have been invited to attend events and conferences around the country, including NHS Health and Care Innovation Expo and the All Party Parliamentary Group Diabetes Innovation Summit, to talk about the project’s exciting vision and approach, which aims to put citizens very much in the driving seat in directing their own care. Download our posters about the test bed project and the digital platform. 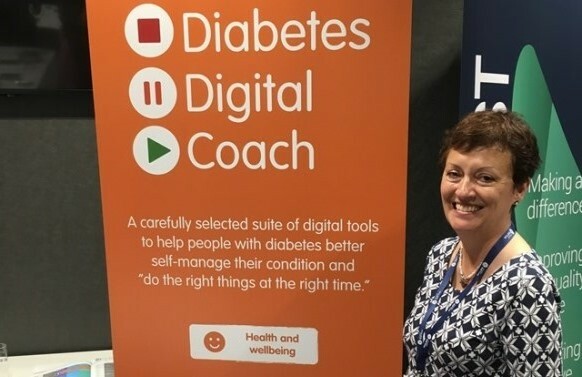 Ahead of the full launch in May, Gloucestershire CCG is currently running a mini pilot with MapMyDiabetes, an online structured education programme which is one of the self-management tools that will be available through the Diabetes Digital Coach platform. Similar pilots are soon to be rolled out, giving patients of Hucclecote Surgery in Gloucestershire access to KiActiv, a 12-week activity and lifestyle tracking system, and people in the Swindon CCG area access to both Lincus (a health and wellbeing programme) and Oviva (a structured education and online dietitian support programme). In the new year, we hope to run out a further pilot in Swindon and Wiltshire with SocialDiabetes, an insulin management self-management system. If you’d like to be kept up-to-date with the Diabetes Digital Coach test bed project and / or enrol on the platform when it launches in May 2017, please register your interest here.